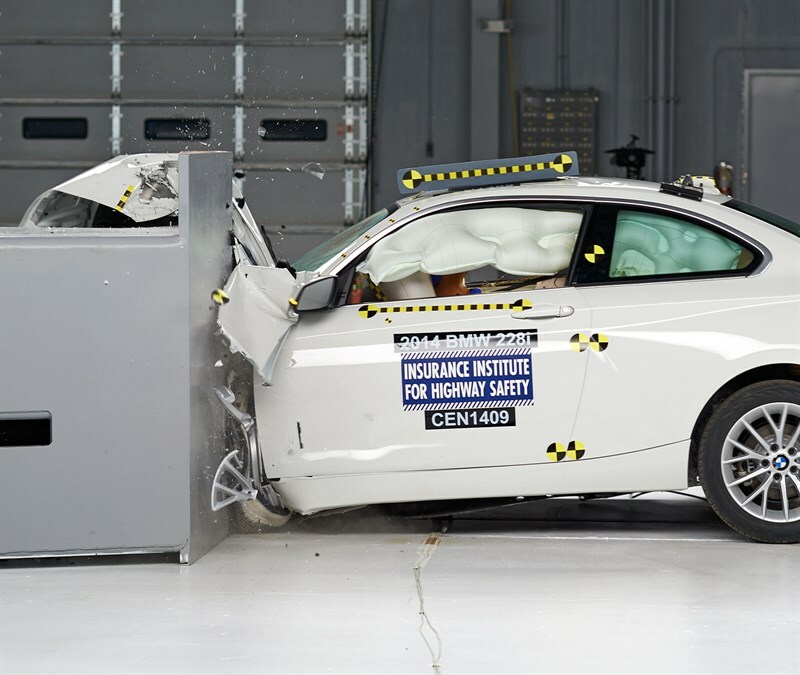 Today IIHS released its BMW 2-series crash testing results and the corresponding rating. 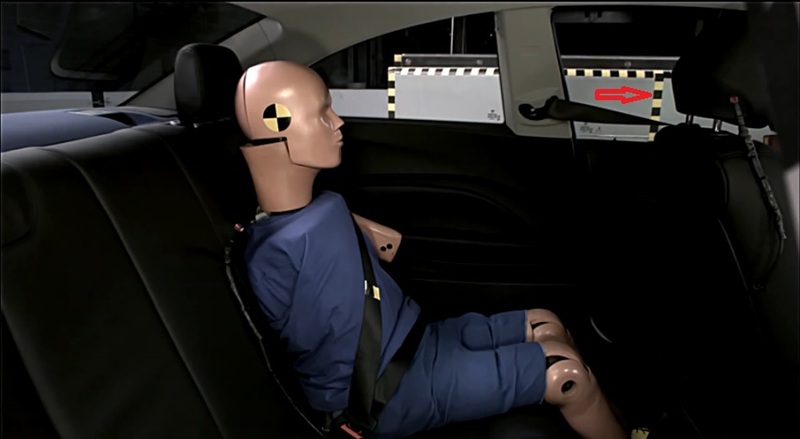 Generally speaking the 2-series got a Top Safety Pick Plus result, which is because it achieved “Good” results in all testing categories, including the small overlap front test, which is shown in the below image (released by IIHS). From the photo you can see the 2-seires has very good safety cage strength to handle the frontal impact energy: there is no excessive deformation around the A pillar area. However, we also found some weak points in the BMW 2-series, from the crash test. 1. The roof strength is only 16,504 lbs, even though it is enough when considering the relatively lightweight of the 2-series; but in the situation that other heavy objects accidentally dropped on your car roof (for example, an pickup truck hit something, and air-borned, then drop on your car), you do want a strong roof to protect you. For comparison, the 2010 Scion xB has a roof strength of 21,041 lbs, which is 27% better than the 2014 BMW 2-series. 2. During the moderate overlap front test, the steering column rearward movement is 6cm, that is a little bit excessive considering this is a newly designed luxury vehicle. 3. The side impact test, result shows the distance from B-pillar to longitudinal centerline of driver’s seat is 23.5cm. This number looks very promising. However, for a 2-door coupe it is meaningless to compare it to other 4-door cars. Major reason: for 2-door coupe, the B-pillar is usually located far behind the driver seat and towards the car’s tail. When the IIHS side impact object hits the car, the B-pillar only touches the side of the impact object (which is curved to the back) and takes less impact force. You can see it in the below two images. 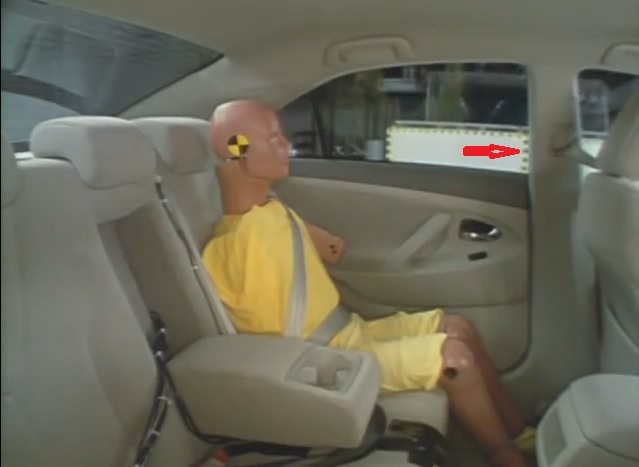 The following is the IIHS side impact test on a 2007 Toyota Camry. Please pay attention to the vertical mark on the impact object, highlighted by the red arrow: that mark will overlap with Camry’s B-pillar, and the B-pillar will receive most of the impact force. This is the same test on the 2014 BMW 2-series. It can be clearly seen that the same vertical mark is located way ahead of the B-pillar. During the impact, the major part of the impact object hits the driver’s door; only a very small section of the impact object touches the B-pillar. If you have taken a look at the side impact video, you may find that in the side impact test, the driver side’s door deforms more seriously than the B-pillar. In a 2-door coupe, it is the door that protects the driver, the B-pillar contributes much less than it does in a 4-door car. Therefore you cannot judge the side impact safety of a Coupe, only base on the number of how far “the distance from B-pillar to longitudinal centerline of driver’s seat”.